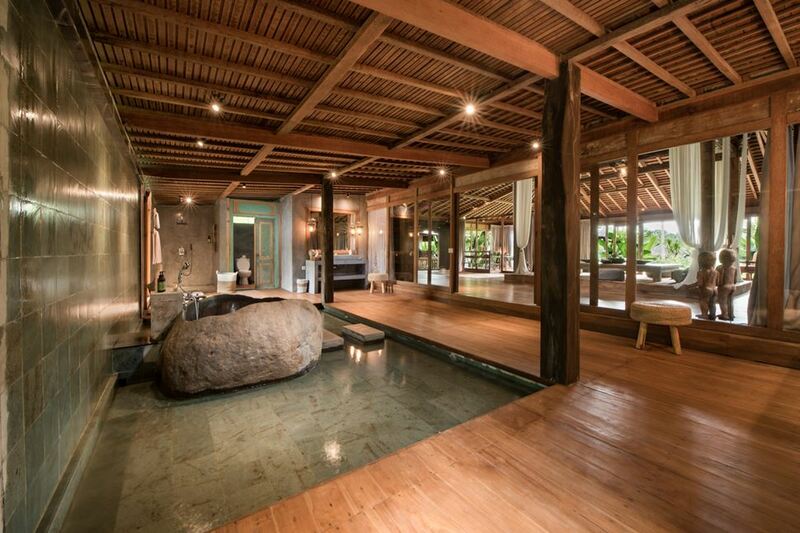 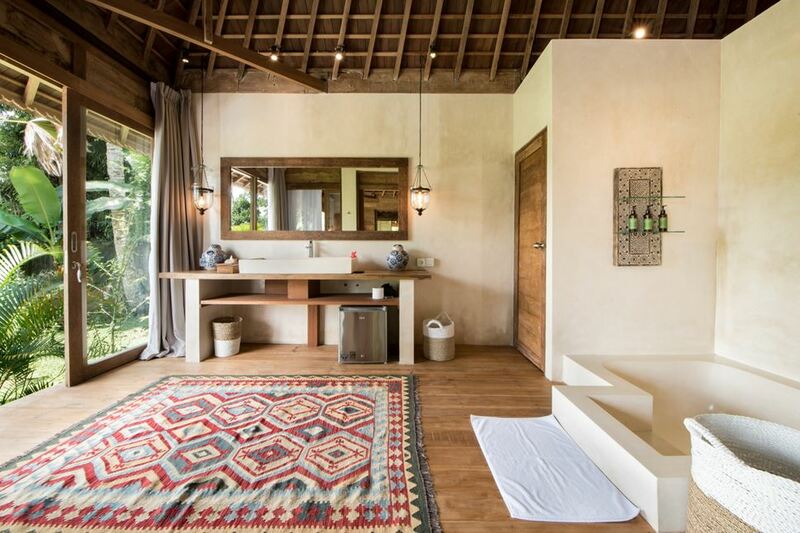 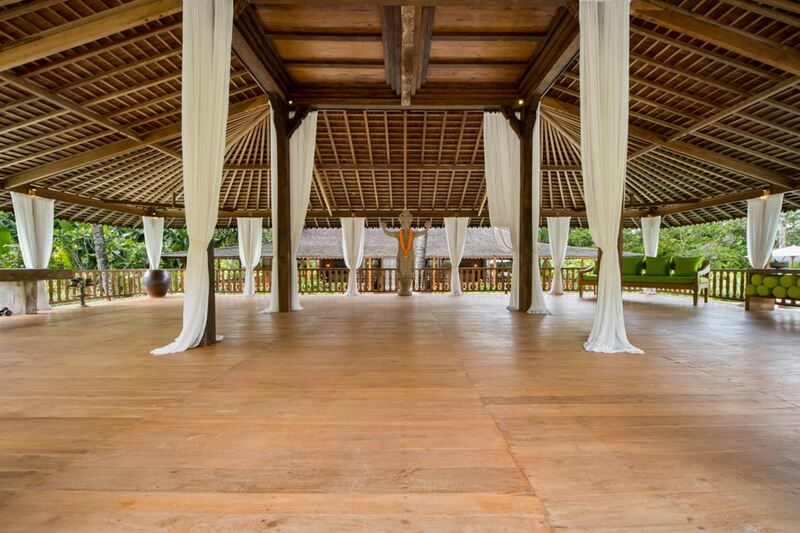 Villa Nag Shampa is found in a traditional Balinese village called Tao, located a 30 to 40-minute drive from Ubud, the cultural heart of this mystical island. 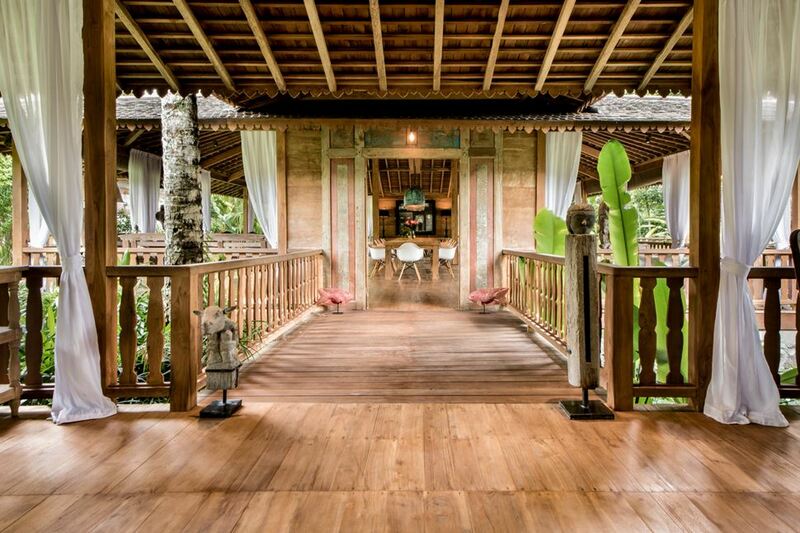 While staying in the villa, you will hear nothing but the wind blow, birds chirping and the sounds of a quiet rural village: the occasional call of a rooster and mystical music from ceremonies at the local village temple. 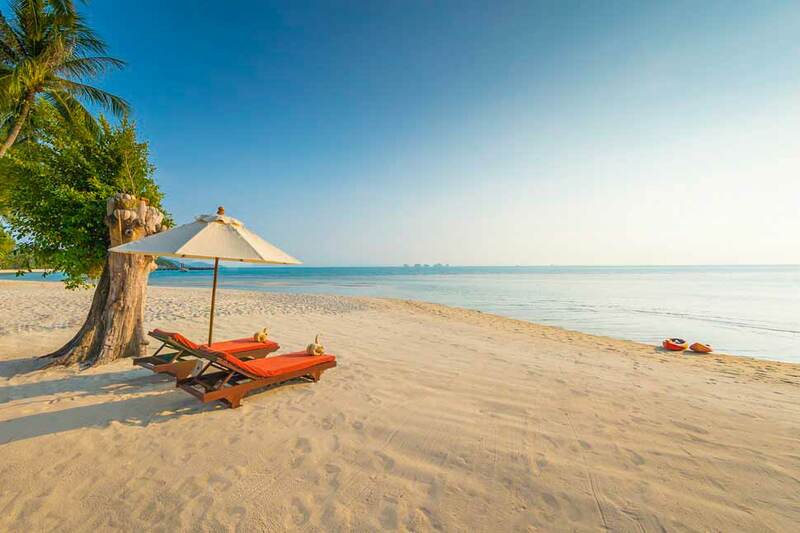 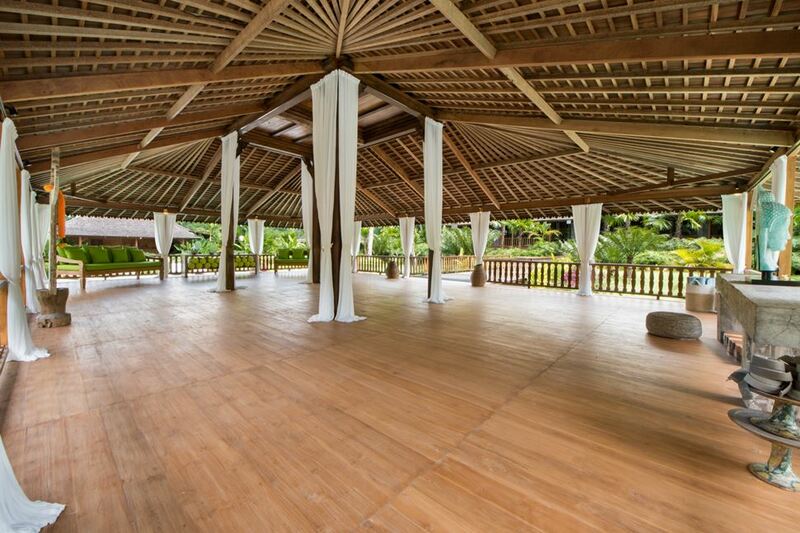 It's a great holiday retreat to reconnect with your body, mind and soul, practicing yoga and meditation in an amazingly peaceful setting, at one with nature. 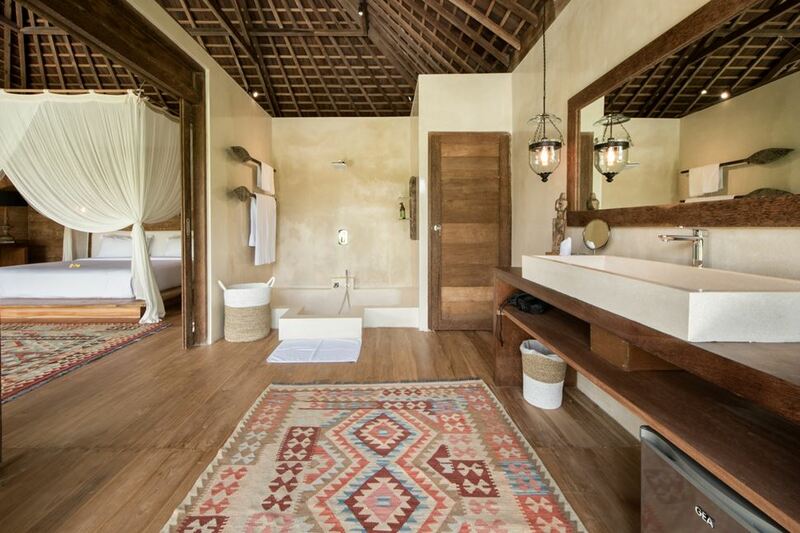 Villa Nag Shampa is really different compared to other villas! 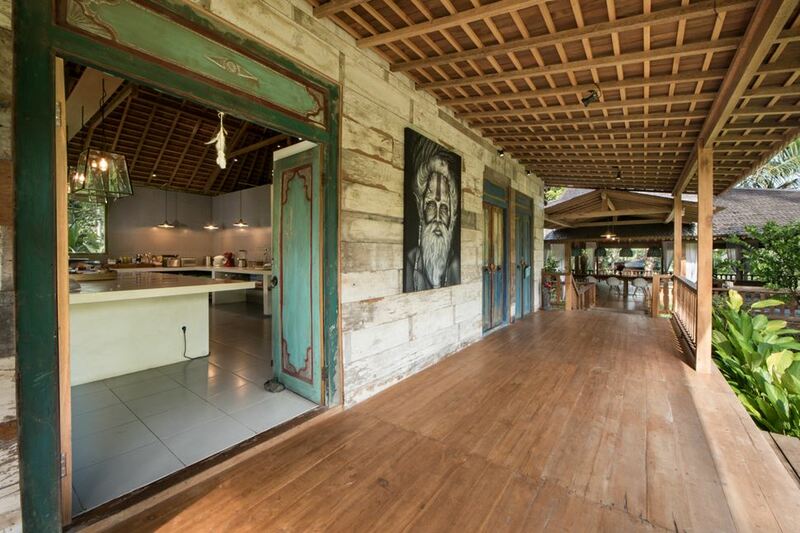 it features a gorgeous wooden house, hand-made with real craftmenship, honoring the culture of this island and it's ancestors. 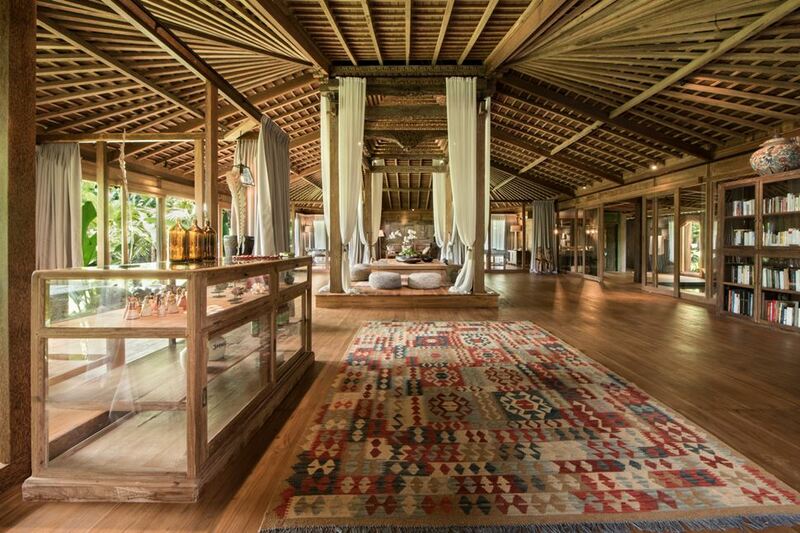 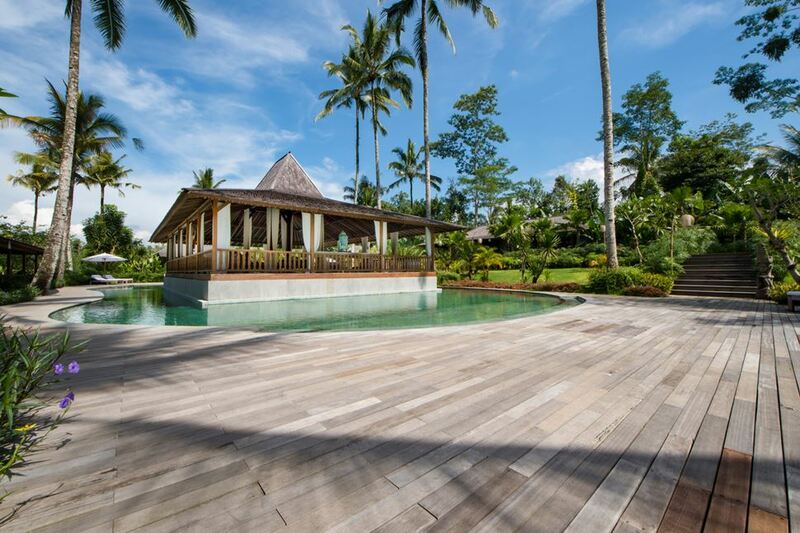 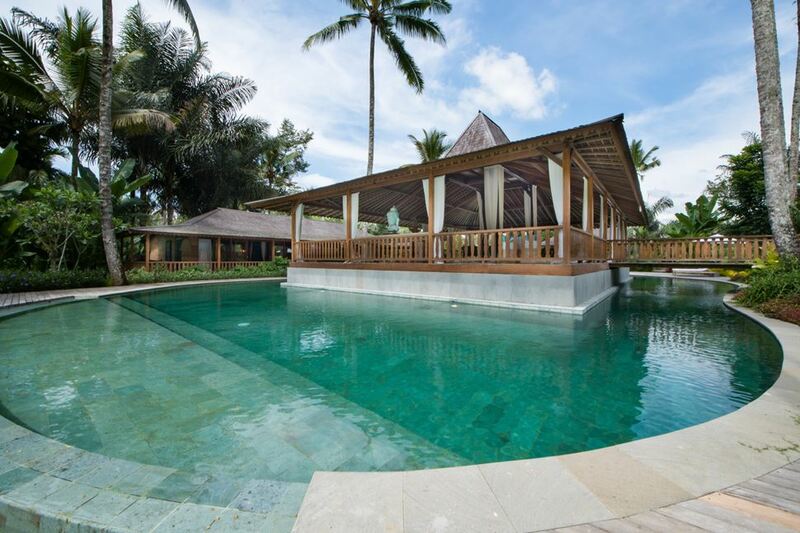 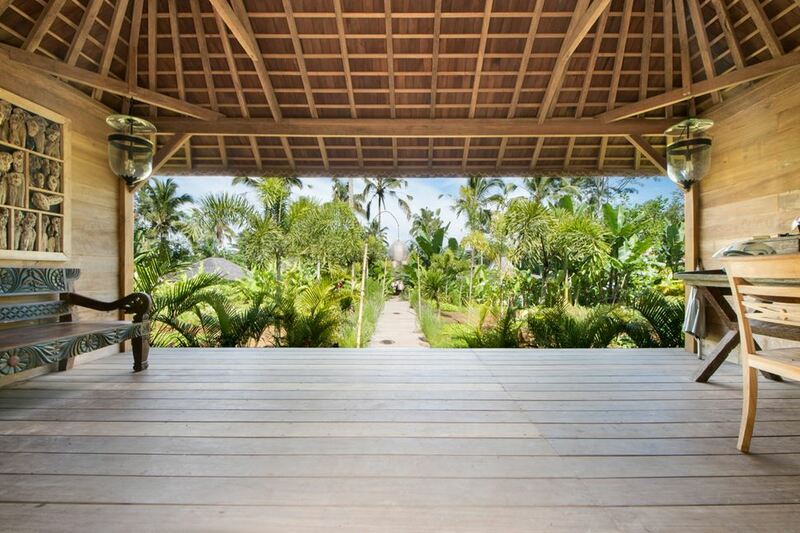 The villa features a breezy open-plan design and a hand-carved rooftop inspired by the traditional Joglo houses descendent from the island Java. 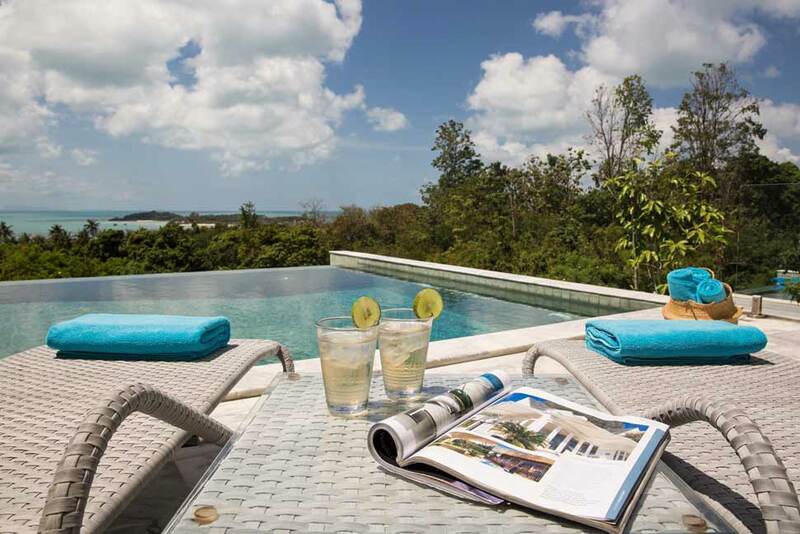 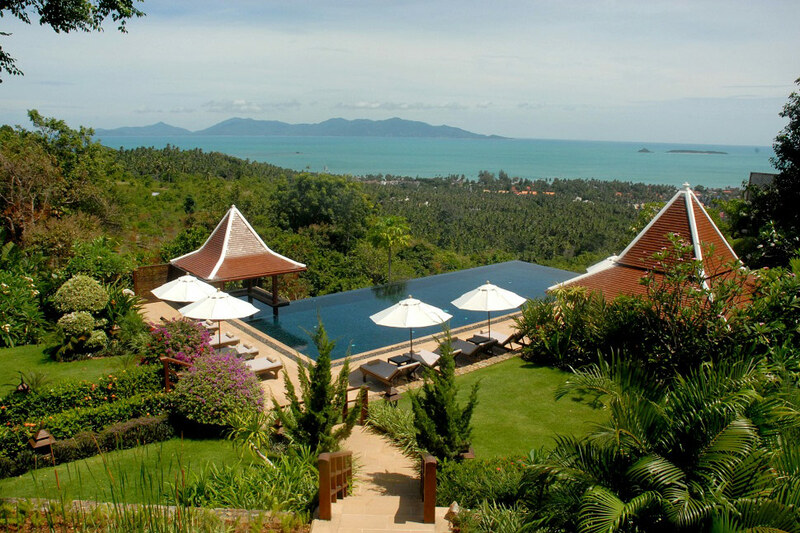 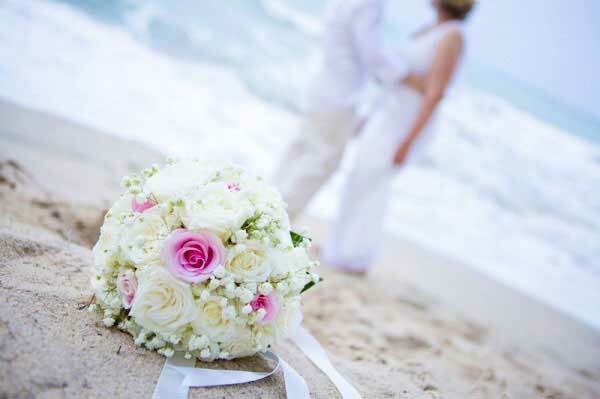 From everywhere inside the villa, you get to take it the magnificent views over the surrounding nature. 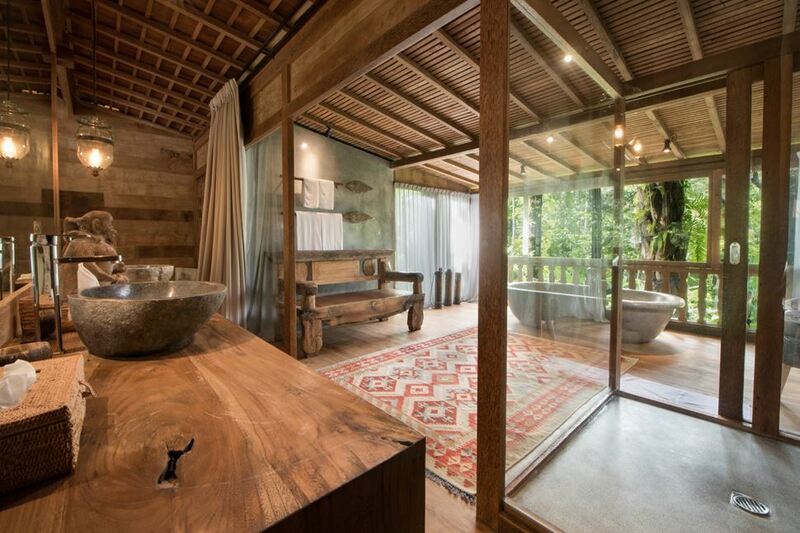 The open-concept design, adds a great sense of spaciousness to the living room while the wood provides a feel of warmth and coziness. 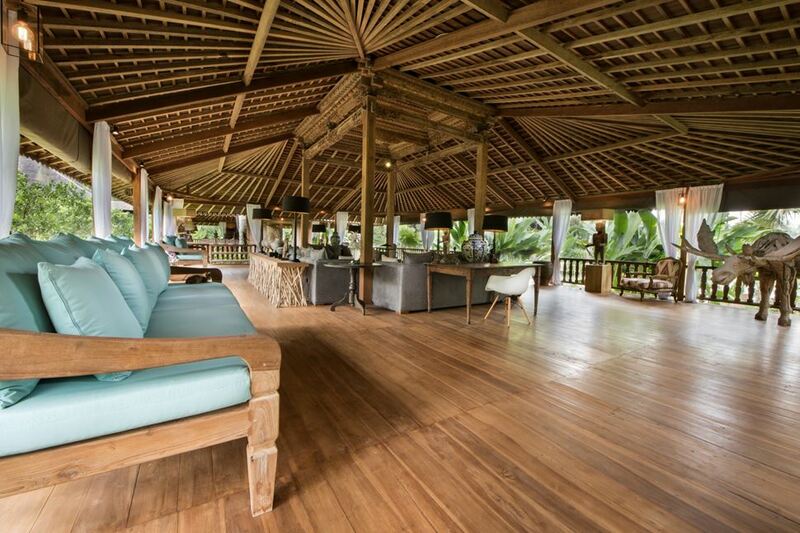 In the heart of the pavilion, in between the four pillars that support the high soaring rooftop, stands an elegant lounge corner featuring three silver-colored sofas. 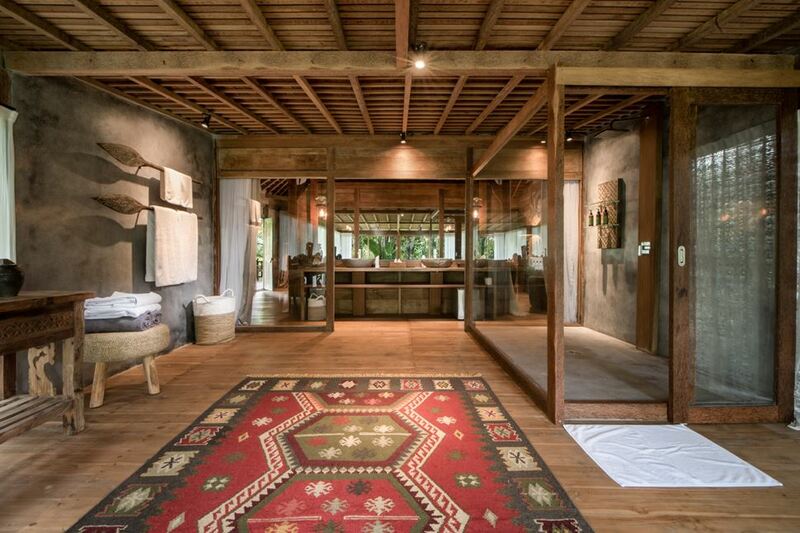 On the sides, there are more comfy places to sit or hang out together, enjoying wine and good conversation or curling up with something to read in a peaceful and quiet setting. 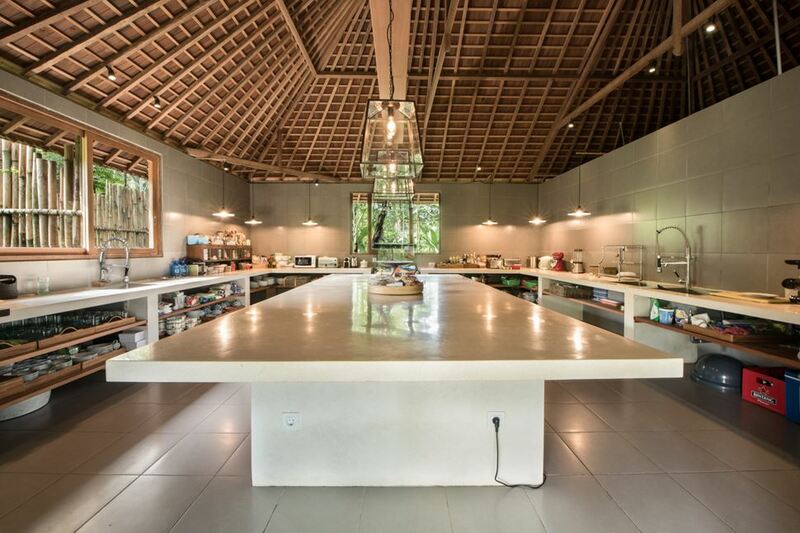 The 14-seater dining table makes a great spot for wonderful candlelight dinners shared among friends and families. 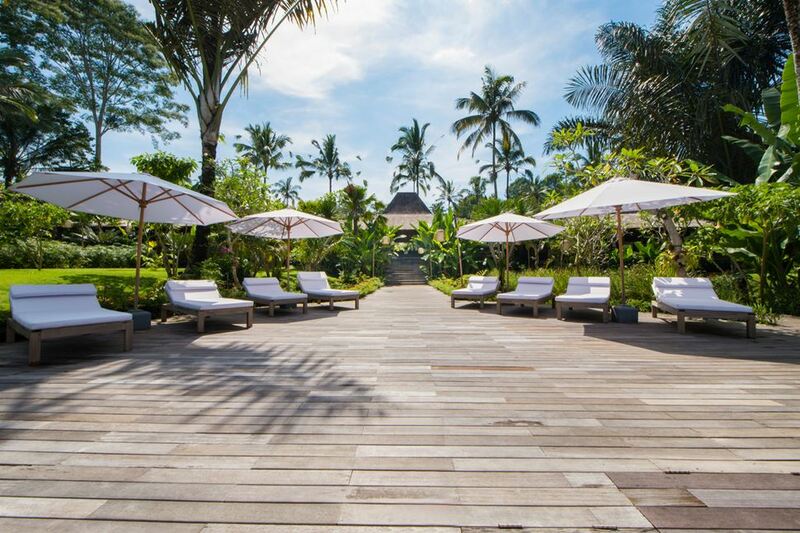 The garden is also spacious and beautiful, planted with tropical palms and more of that lush green beauty of Bali island. 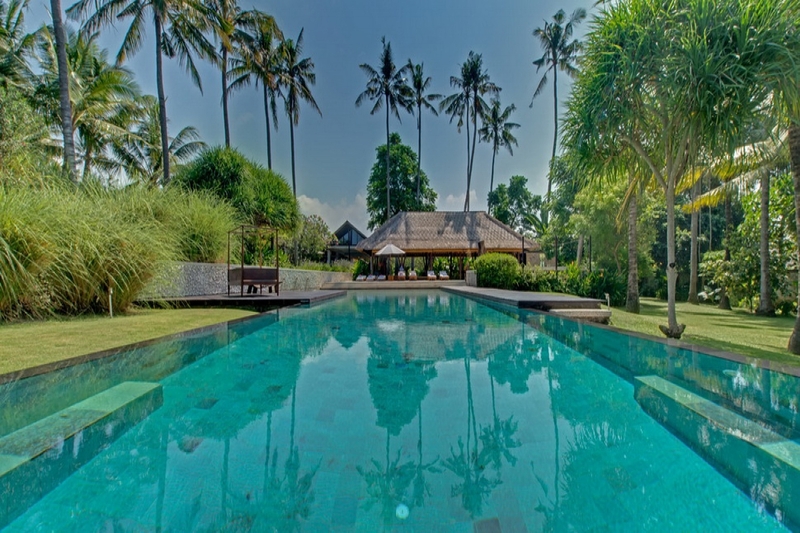 In the garden, you will find multiple swimming pools, sparkling brightly in the sun, giving lots of privacy to all of the guests staying at Villa Nag Shampa. 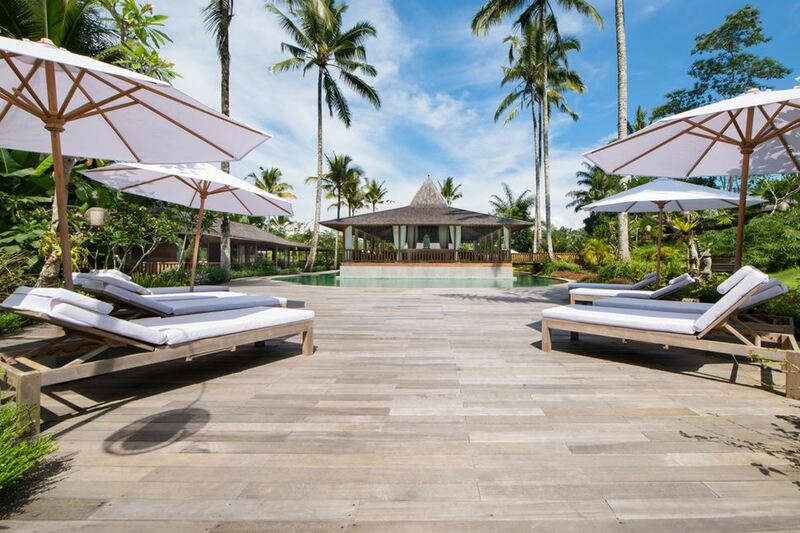 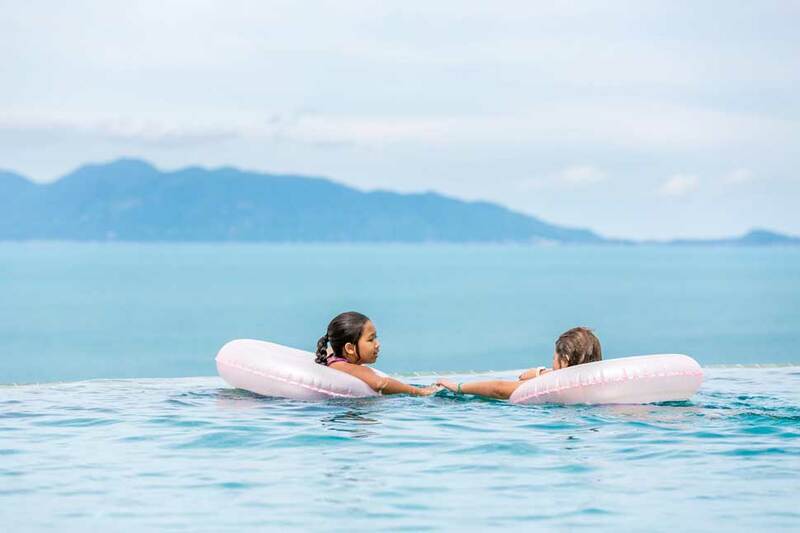 The pools are encompassed by timber decks where guests can soak up the sun, catching that gorgeous tan or snoozing to the sounds of nature in the shade of a large white parasol. 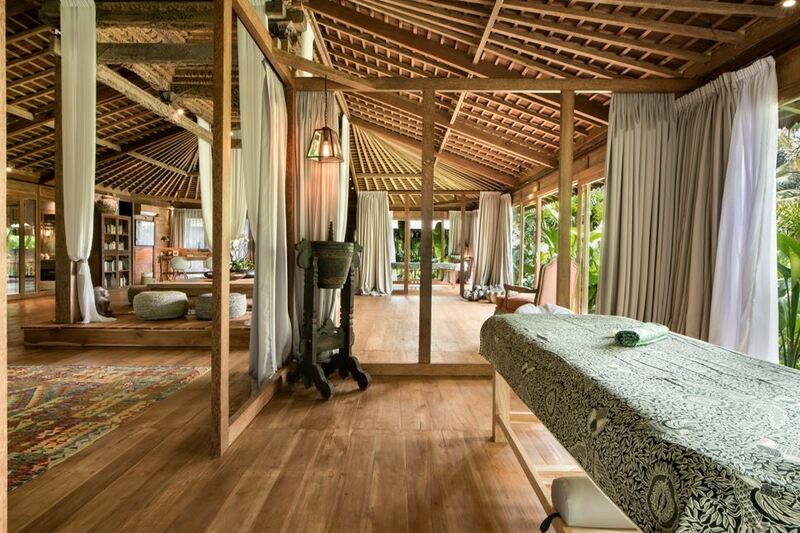 Don't miss out on a rejuvenating massage in the private spa pavilion on premises. 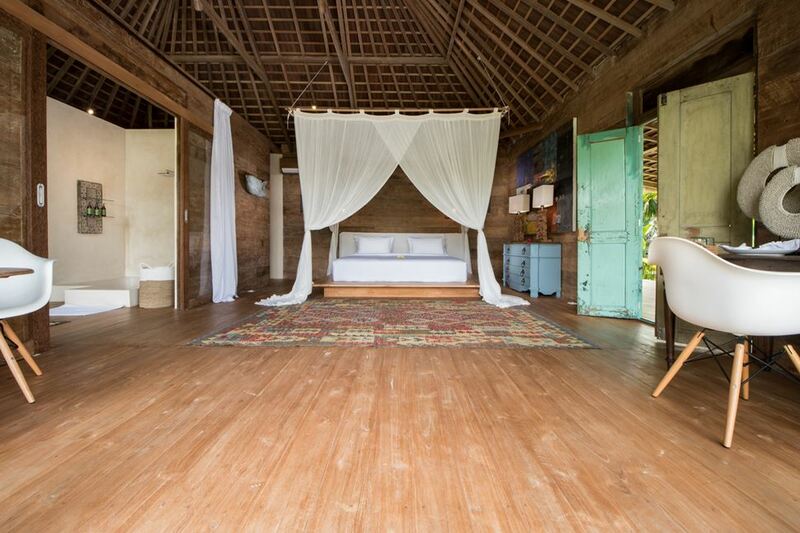 All of the 7 bedrooms at Villa Nag Shampa are equally spacious and beautiful. 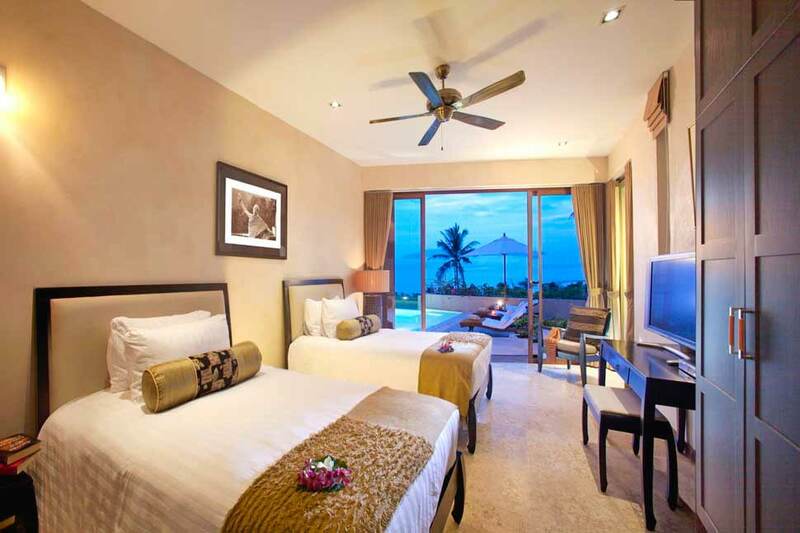 Light-filled in the day, overlooking the outdoor areas and cozy at night for guests to indulge a perfectly restful night sleep in air-conditioned comfort. 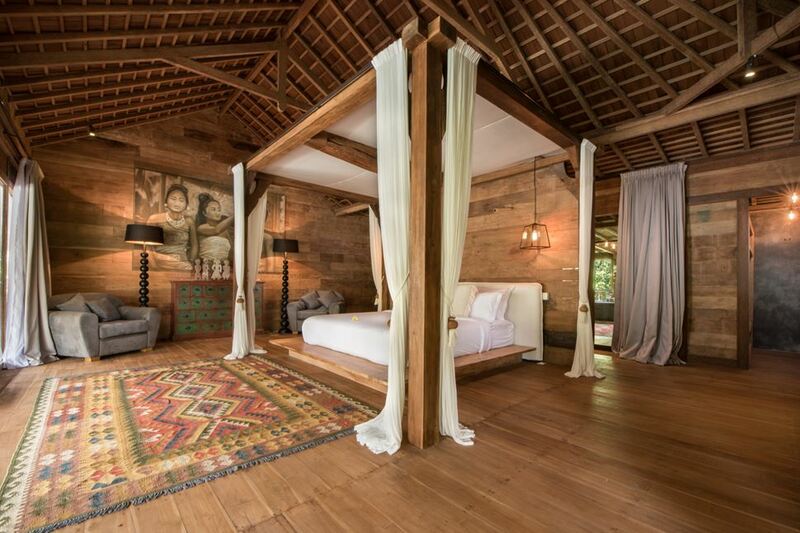 The rooms exude warmth with their stunning timber in- and exteriors and the rooms are enriched by beautiful oriental carpets and king-size beds draped in white curtains. 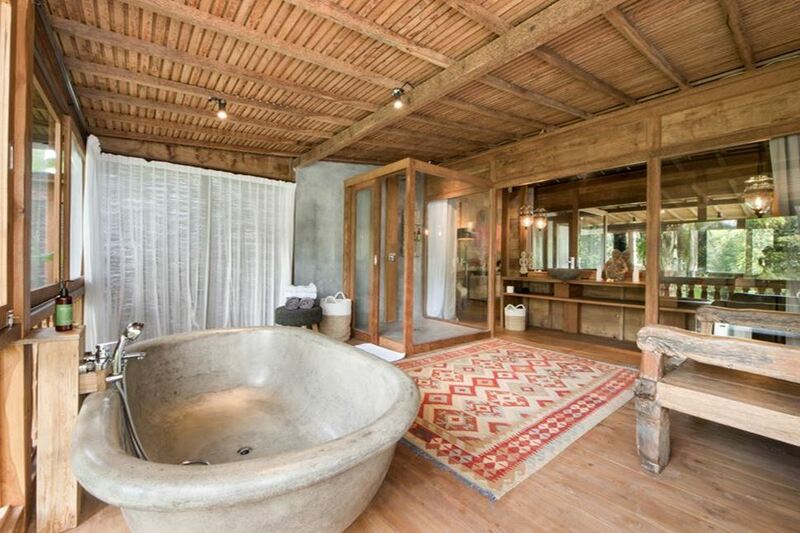 Each room also boasts a huge private en-suite bathroom fitted with a lavish bathtub and shower from where you can gaze at the tropical nature outside. 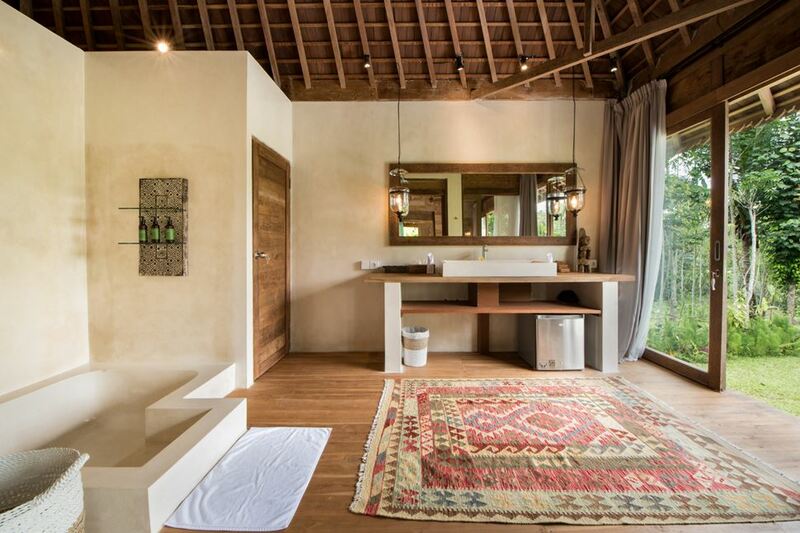 The complimentary soap and shampoo are organic and fragranced with essential oils. 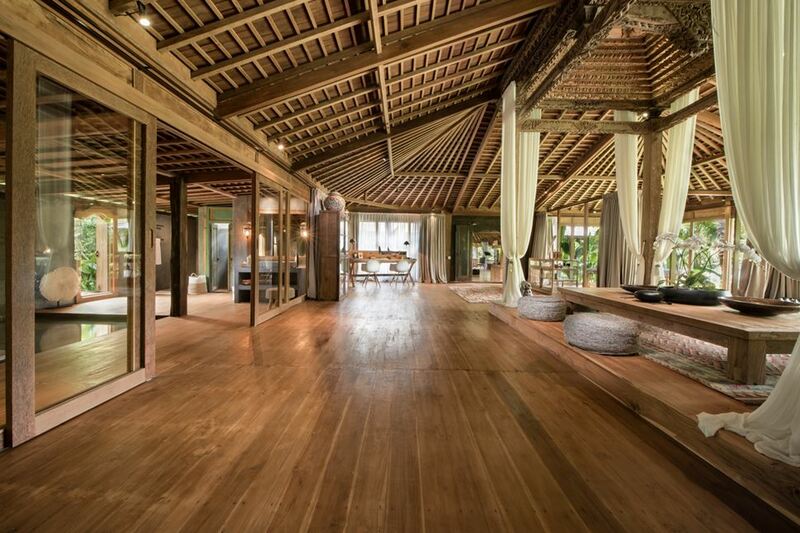 Villa Nag Shampa is just breathtaking! 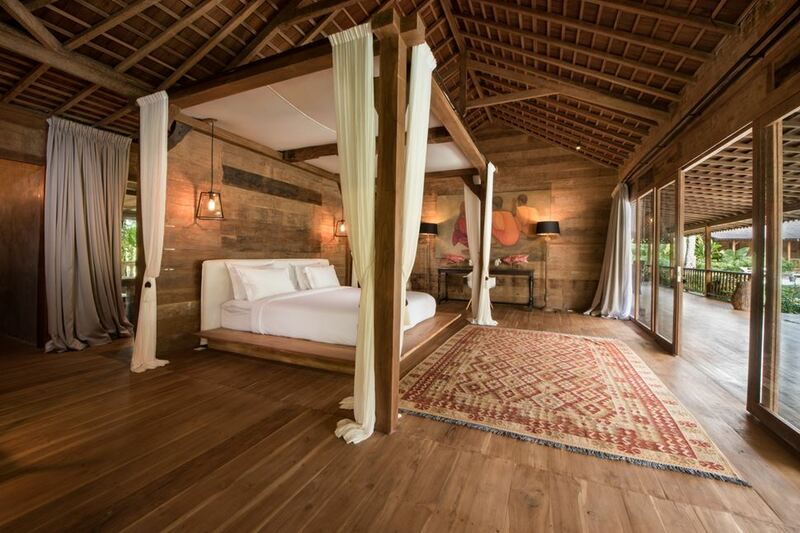 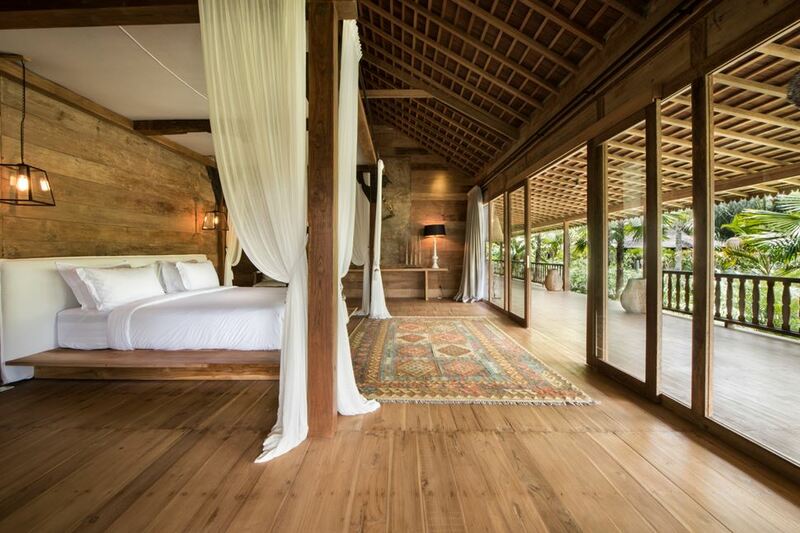 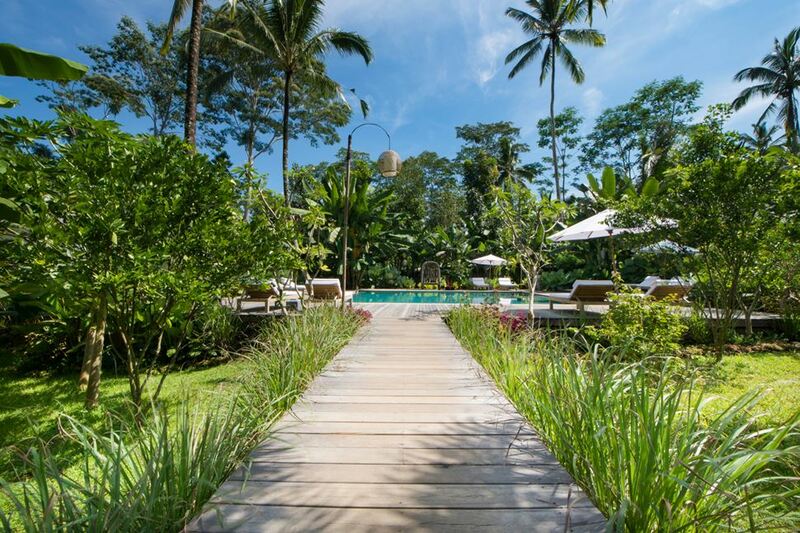 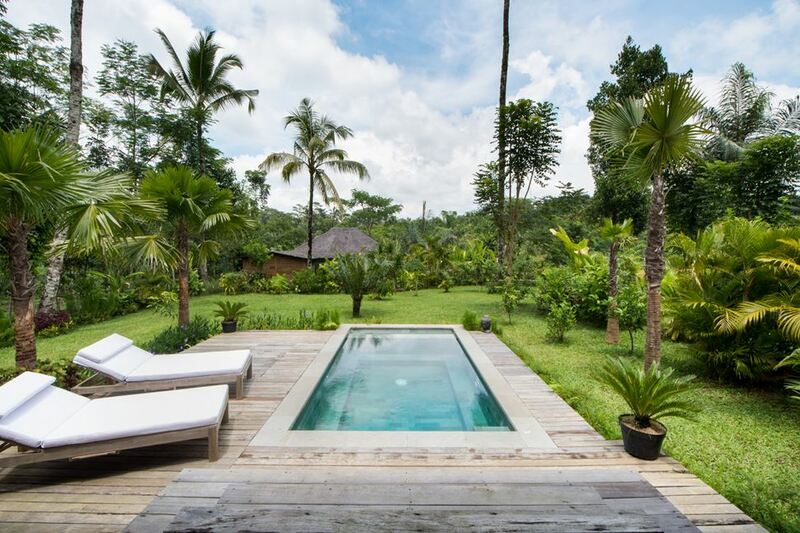 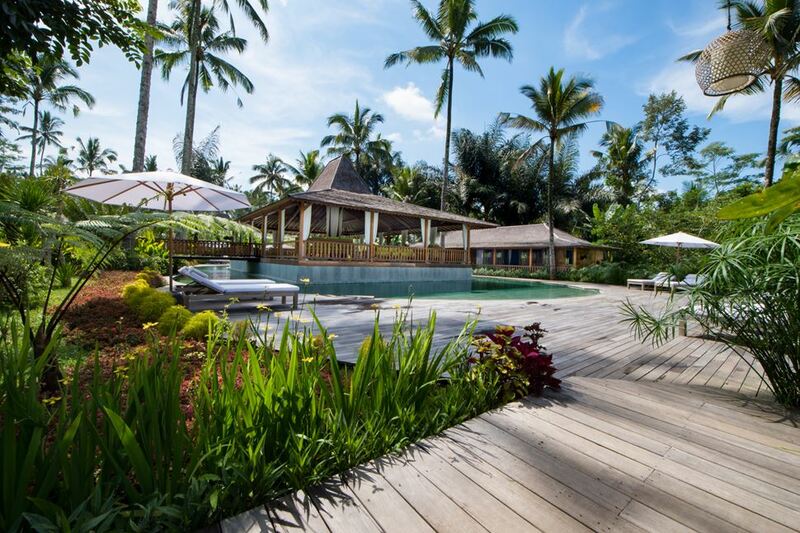 Nestled in the lush untouched nature of a traditional Balinese village, near Ubud in the heart of Bali island.